Ability Requirement Hack 2 - Code it yourself! The infamous ARH comes back, better than ever! ARH2 removed all tables and you are pretty much forced to ASM in the requirements that you want. 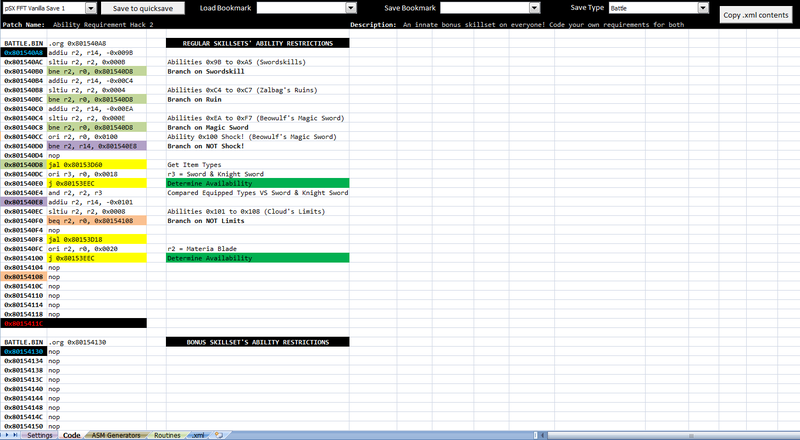 It is, however, as friendly as possible for coding that I could think/manage inside of Excel's limitations. Why did I do this? People kept requesting different things for the ARH, and ultimately, bending to everyone's needs would have created needlessly huge data tables, consuming absurd amounts of space when most people hardly use any of the ARH's capabilities. Now with all that junk gone, the ARH was trimmed down from the equivalent of 831 Kanji space lines, down to ~350 Kanji lines + 22 SCUS lines, including major upgrades. 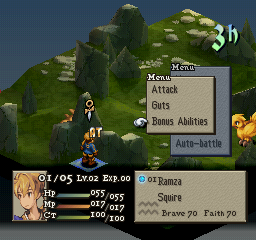 Its main new feature is a skillset innate to every unit in the game, the "Bonus" skillset, which can contain ANY regular action ability in the game (i.e. not chemist/draw out/charge type abilities). All you have to do is configure the requirements for those abilities. Before, the only way these could be recalculated was if the unit used equip change or had a piece of equipment stolen/broken. Now, at the start of every turn, and during them, abilities recalculate their conditions, so that requirements of status based nature and the like aren't Player only abilities anymore. Vanilla requirements are already coded in! This probably isn't a consolation to many people, but Swordskills and Limit Breaks have their requirements already set up like they were in vanilla. If anything, at least it shows you how to code it yourself. Just use some very convenient routines that I made myself to very quickly determine if an ability will be enabled or not. I figured other routines were pointless due to how few lines they would actually require without much complexity involved. Of course, it isn't perfect, but you have options to save directly to your pSX quicksave to see the results of your coding LIVE, immediately. You can also copy the xml's contents with a single click, on top of functionality like bookmarks to save your positions in code. or if I would have even finished this hack! Re: Ability Requirement Hack 2 - Code it yourself! My knowledge is very basic though, I've only managed to edit some formulas and effects. So I'll save my questions until after the tutorial is released. Honestly? Ask away. It will give me stuff to write for the tutorial. I haven't had the chance to play with it yet but will try to tonight. Thanks! Edit: Played around with it but i obviously need to brush up on some ASM as I am clearly incompetent. My jaw dropped, and hung their til my wife called me on it. Well, I'll be looking at this after work tomorrow. If only something like this existed for more of the stuff in this game. Let's say I were to use this to upgrade how Lancers work a bit. Obviously I can't put Jump abilities in the bonus skill set. But let's say I keep the regular jump skill set as the Lancer's main and edit all the skills to give the same vertical and horizontal ranges say all are +5. I make a new normal set of skills to represent 8 dragon skills. Next I edit the names of the jump skills to match the new dragon skills. Then I use ARH to link each jump skill with it's related dragon skill. If I did everything correctly then each time I have the Lancer learn a disguised jump skill it should add the linked dragon skill to the bonus skill set. Am I understanding it's use correctly and would this work? I figured it would be smarter to just put in the skills inside the skillsets, disable them for regular skillsets (Just in case the AI derps out) and add them to the bonus skillset. I just tested in game to make sure, and the new abilities don't mess with the jump skillset at all. And you'll have to wait until I release the damn thing again, because even though I got 25 downloads, no one reported it as broken as hell... I might have entirely fixed it yesterday, but I need more testing to make sure. In the meantime, just removing the file. Is the name of the Bonus Ability skill command set in stone? I was thinking it would be nice to be able to have different names based on the primary skill set. So as per my above example I could have it labeled "Dragon Skills" if the unit is a Lancer or if they are a Ninja I could have it labeled "Ninjutsu", etc..
You can name it whatever you want; it basically overrides any skillset you want. But there also aren't multiple skillsets, so if you want many names, you'll have to code that yourself. When you say that the AI doesn't consider the skills passed 15, do mean active skills or total skills? Like if I have a list of 36 skill and only the last 4 are the only active ones will they be ignored?